WINTHROP -- A fire that ripped through a Route 41 home Tuesday morning left a woman and her daughter looking for a place to live. WINTHROP — A fire that ripped through a Route 41 home Tuesday morning left a woman and her daughter looking for a place to live. The single-story, hip-roofed home owned by Becky Pottle was badly damaged during the blaze, said Fire Chief Dan Brooks. “The four walls are standing, but the inside is gutted,” Brooks said. Nobody was home when the fire broke out. There were no injuries, but Pottle, who shared the home with her 16-year-old daughter and a cat, will be forced to live with nearby family members, said Pottle’s mother, Gloria Pottle, who lives next door. The home is insured, Gloria Pottle said. Gloria Pottle saw smoke coming from the house and called firefighters around 10 a.m. 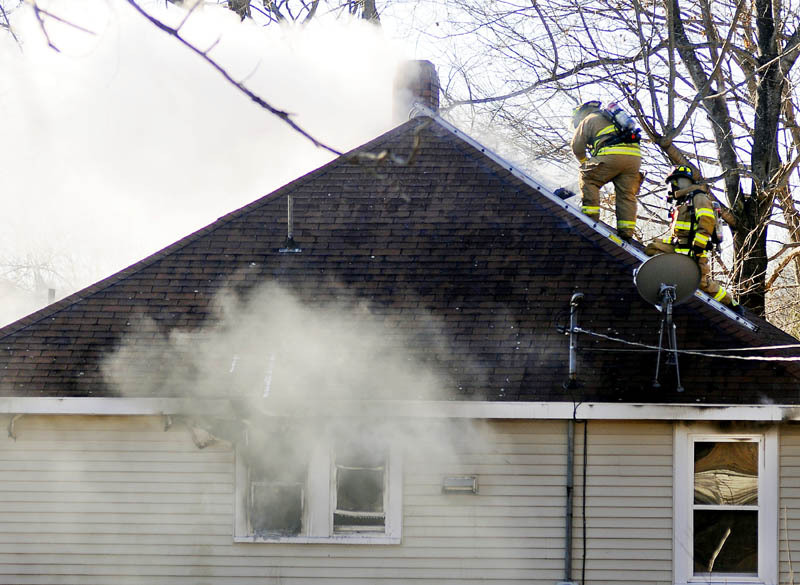 Firefighters from Readfield, Monmouth, Augusta and Winthrop helped fight the fire, which broke out just a few houses south of the Readfield town line. Winthrop Deputy Fire Chief David Currie, one of the first people to arrive, said he saw smoke and heavy flames in the main living area. “It was blowing out the back pretty good when we got here,” Currie said. Currie said it took about 20 minutes to get the fire under control. The flames were out shortly thereafter. Firefighters had to cut a hole in the roof to allow smoke and heat to escape. Flames shattered the windows and licked the white trim and tan vinyl siding, leaving them charred and melted. Currie said the fire broke out in the main living area and spread to the attic. He was not sure what might have sparked the blaze, but an investigator with the State Fire Marshal’s Office was expected to arrive Tuesday afternoon. There was nothing immediately suspicious about the blaze, Brooks said. “It’s more routine than anything,” Brooks said of the decision to call for an investigator. Currie and Gloria Pottle said they were thankful the fire occurred while Becky Pottle was at work and her daughter was at school. Gloria Pottle said her daughter and granddaughter have lived at the home for more than 10 years. She was thankful the family’s cat had escaped and was safe. “I don’t even know what the condition is inside,” Gloria Pottle said.